Everybody knows about a good diet that helped their sister, mother, friend lose a certain number of pounds and they always want to share it with you when you complain about your weight. Unfortunately, that diet has a pretty slim chance to actually work for you, because everybody is different. Metabolism plays a big role in this affair and you probably noticed that you don’t lose weight as well as you used to. So, don’t follow every advice you can find, try to follow some logical rules to keep that weight off. A diet is for life; I’m sorry to tell you this but it’s the truth. If you follow a strict diet for a few months and then go back to eating fast food and sitting on the couch all day, you will get back to your previous weight; in most cases even more weight. So, make sure that you don’t start with something strict, but with something that will work on long term. Trying to eat low fat, low carbohydrate, low everything all the time will only make you hungrier. Being hungry all the time is counterproductive for your diet and will keep you from achieving your goals because you will give in to temptations sooner or later. If you expect to lose 100 pounds in 5 months, you are deluding yourself. Sure, you can achieve that but it will damage your health and they will come back so fast you won’t even get to be happy about your new figure. So the best advice when it comes to eating, eat foods that are nutritious and they make you have more energy. Don’t skip a food group just because it’s “bad”. 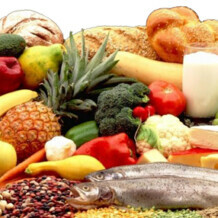 Proteins, fats and carbohydrates are equally important but make sure that you get them from the right foods. For example, get carbohydrates from vegetables or fruits not from that nice looking chocolate cake. The same goes with fats, don’t get your fats from a hamburger, get them from fish or olive oil. When it comes to protein, lean meat and less red meat will be the best choice. Many people say that they don’t have time to exercise, forgetting that exercise is not about only fitness and weight training. You can go for a walk if you are too busy, or you can simply go out and dance with your friend. It’s fun and it keeps those calories off. You have to understand that if you start weight training or fitness and go to the extremes, you won’t be able to continue doing it for a long time. But starting light and increasing the difficulty of your exercises will help you reach your goal; you will do it slowly, but you will get there. If you find this too slow, think about all the years you spend finding the right diet and being hungry all the time when you could have done this and would have been thin while reading this article. Remember that losing weight is all about the journey and how you change your habits into healthier one, not about the destination.